In 2006, the second-generation smart fortwo was unveiled in a Stuttgart parking lot. Why? It was to prove that, despite its 20 additional centimetres, two smart fortwos could still be parked in a single parking spot. The third generation has just launched in Berlin, and it didn’t have anything to prove: the 2016 smart fortwo 2016 remains as small as ever. The good news starts there. 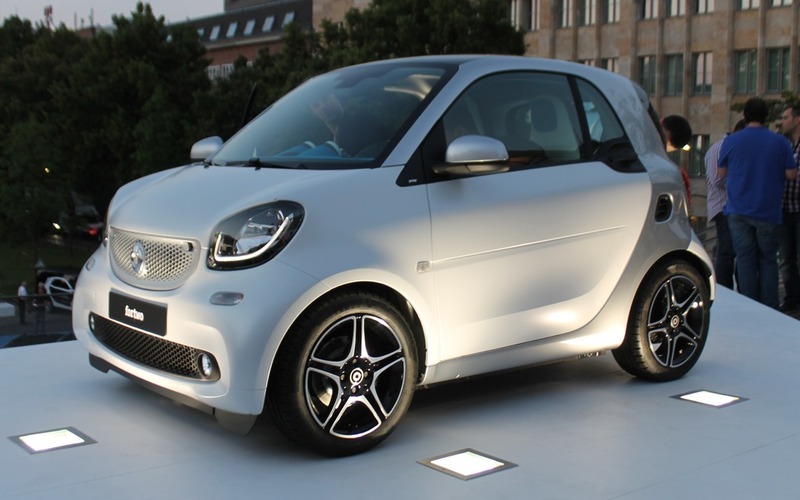 At only 2,695 centimetres in length, the next smart fortwo, set to arrive in the summer of 2015, can still be parked sideways. Another piece of good news is that the five-speed automatic gearbox, whose chaotic shifting received so much bad press, has been replaced by a new six-speed transmission with a twin clutch for added smoothness. The fact that the smart fortwo is offering a five-speed manual for the first time in its history is a nice surprise. And yes, it will be available in North America! Also: Want A Bigger Sound System In Your smart? Considering that the Nissan Micra and Mitsubishi Mirage four-seaters are going for less than $10,000 CAD, we may see a reduced price for the smart as well. Ready for more good “smart” news? First of all, there are brand-new gasoline engines underneath the trunk carpet, still powering the rear wheels. Obviously, they are three-cylinder engines. Logically, you’d expect it to be the same naturally aspirated engine (1.0-litre for 71 horsepower and 67 lbs.-ft.) found in the current version, but the engine earmarked for the North American market is a turbo that develops 90 horsepower and 100 lbs.-ft., making it one third more powerful. A final three-cylinder gasoline engine, with a mere 60 horsepower, will join the party, but don’t expect to see it on this side of the pond. You should also note that, like the previous generation, there is no diesel engine, even for Europe. Perhaps one day we’ll return to the engine that powered the first-generation smart. It’s too soon to be sure about fuel consumption, but we can safely speculate that the supplementary power and an additional forty kilos could undermine much of the current version’s frugality. On the other hand, the new smart will finally have a stop-and-start device, probably on option for North America, and that’s always good for reducing fuel consumption in town. No electric version is required since the current-generation smart fortwo electric drive (100% electric) is still going strong, but we’ll keep an eye on this situation, along with hope for a convertible version, which no one at the Berlin presentation was willing to consider at all. While the second-generation smart fortwo didn’t stand out much from the first, the same cannot be said for this third generation. Instead of the nice plunging hood (okay, half-hood), the nose rises horizontally in order to comply with European pedestrian safety standards. As a result, its harmless face has been replaced by a brasher mug. Also, the angles are rounded and the hatch still stands straight up (still in two parts), and is perhaps a little too reminiscent of the Scion iQ. But the smart spirit remains in the almost non-existent overhangs and the unstoppable Tridion safety cell. The heart of this new design is the honeycombed front grille that has been brought back many times over the years with the smart ForUs, ForJoy, ForVision and ForStars prototypes. If you have a keen eye, you’ve already noticed that our photos, snapped spontaneously at the worldwide launch of the next smart in Berlin, also show a four-door version of this urbanite. Sorry to burst your bubble, but this brand new smart forfour, smart’s umpteenth attempt at a four-door/four-seater, is not destined for our market, or “at least not for the time being”, according to the brand’s Canadian directors. What’s hiding beneath the body of the most recent fortwo? None other than the European Renault Twingo’s platform. In fact, while the 2016 smart fortwo will continue to be assembled in Hambach in the beautiful Lorraine region of France, the smart forfour will instead be made in the French partner’s plant in Slovenia. Although the overall length had to be maintained, says Annette Wrinkler, the very colourful boss of smart, the designers still managed to get their revenge by adding 10 cm to its width (now 166 cm). The height remains the same. The suspension still relies on front struts, but they have been modified by drawing on the Mercedes C-Class. The DeDion axle continues to support the rear (the smart is the one and only car on our market to feature this architecture), but they promise us that there’s more clearance for greater comfort. What is certain is that the 2016 smart fortwo should be more stable on the highway thanks to crosswind technology among other things, which comes factory standard in Canada and uses the brake to reduce the chronic blowing off course that plagues microcars. It still has rack-and-pinion steering, but it will be improved by the Direct-Steer system, for a variable ratio and electric assistance. We’ll have to wait and see if something similar will cross the Atlantic and, if so, if it will come factory-standard on the smart fortwo or not. In the meantime, you have to take the word of the brass at smart who guarantee an even smaller turning circle. At 7.3 metres, that’s a metre and a half less than before and a jab at the eight-metre Scion iQ. The microcar is wider and as a result the new 2016 smart fortwo’s passenger compartment is roomier. The most significant progress in this generation is that it uses higher-end materials (we like the textiles borrowed from the world of sport shoes), a pleasantly more lavish steering wheel, a console on the floor with added storage, and even a space that affords the passenger more room for their knees. There’s more user-friendly connectivity and safety is enhanced by new driving aids, lane departure assist and forward collision warning. However, there’s no cross-traffic alert (in reverse) on the horizon. What’s left? There’s the legendary frog-eye gauges at the top of the dash and the seats remain integral in the sense that the headrest is united with the rest of the body of the seat. The padding is more generous, just like the loading capacity (up by 20%, now with 260 litres behind the seats). So it can’t be used to rob an Ikea, but if the smart forfour and its 1,000-litre loading capacity (see our photos) ever makes its way to North America, that may change. News Want A Bigger Sound System In Your smart?